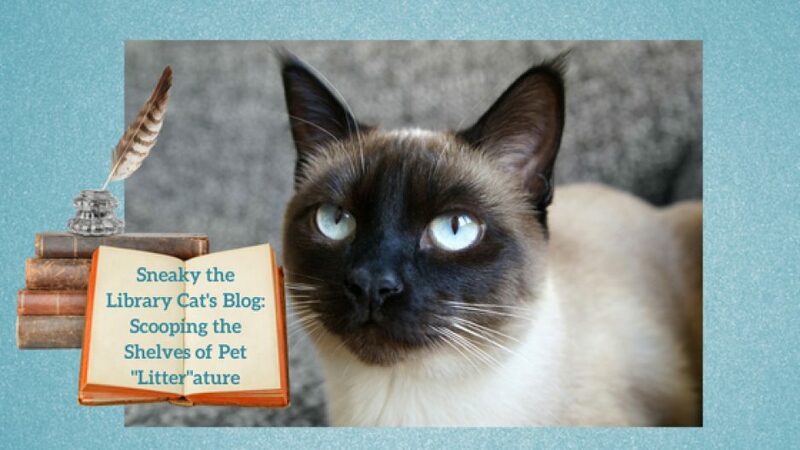 Sneaky here with a pawsome interview of the authors and dog characters of To Fetch a Thief, A Mutt Mystery, that’s on tour with Escape with Dollycas Into a Good Book. Meow there. Please excuse my feline accent, but I’m not used to interviewing humans, although I’m glad to see that you’ve brought along your dog characters, too. I’m pretty proficient at Canine, having been around my dog co-star Fido from my Cobble Cove mysteries. Can one of you tell me about your new release? 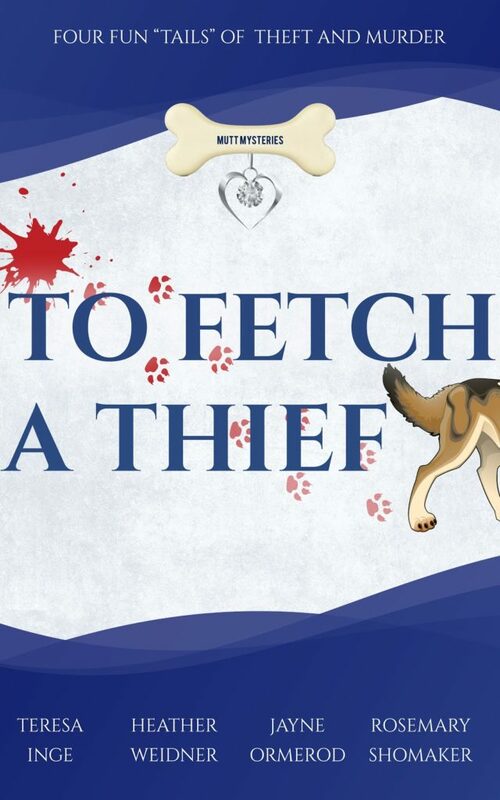 To Fetch a Thief is the first collection in the Mutt Mysteries Series. It’s four, dog-themed novella mysteries. The authors are Teresa Inge, Heather Weidner, Jayne Ormerod, and Rosemary Shomaker. Hot dog that sounds good. What book(s), novella(s), or short storie(s) have you or your authors appeared in? Teresa Inge: Her stories appear in the Virginia is for Mysteries series and 50 Shades of Cabernet. Heather Weidner: Her stories appear in the Virginia is for Mysteries series and 50 Shades of Cabernet. She is also the author of the Delanie Fitzgerald mystery series: Secret Lives and Private Eyes and The Tulip Shirt Murders. Jayne Ormerod: She is the author of the Blonds at the Beach Mysteries, The Blond Leading the Blond and Blond Luck. 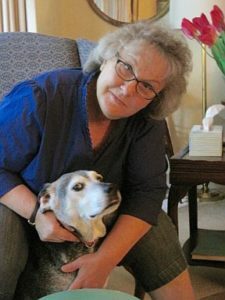 She has contributed seven short mysteries to various anthologies to include Virginia is for Mysteries, Volumes I and II, and 50 Shades of Cabernet. Rosemary Shomaker: She writes women’s fiction, paranormal, and mystery short stories. Her stories appear in the Virginia is for Mysteries series and 50 Shades of Cabernet. Heather Weidner: Heather writes a mystery series, The Delanie Fitzgerald mystery series with a sassy PI who tends to get herself in and out of humorous situations. Jayne Ormerod: Jayne writes the Blonds at the Beach mystery series. You authors have loads of experience. 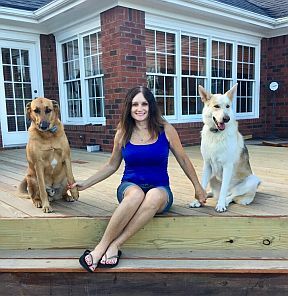 My author writes the Cobble Cove mystery series, but it is more cat-oriented, and I’d like to think I’m the star although it also features two dogs — Fido and Ruby. Are any of the dogs in this book based on a real dog such as one of the author’s? If so, please give further details. 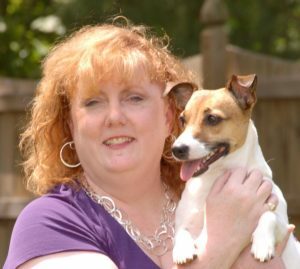 Heather Weidner: My character in “Diggin’ up Dirt” in To Fetch a Thief is Darby, the Jack Russell, and she helps her owner unearth some hidden clues. Darby is based on my Jack Russell Terrier, Disney. She and her brother Riley rule our house and keep us on our toes. Jayne Ormerod: No, I am based on a picture my author got off of the Internet. She was dog-less at the time. But I have the loyalty and curiosity and love for daily walks that all of my author’s other dogs had. Rosemary Shomaker: Hello, Sneaky. Thanks for asking us, the To Fetch a Thief canine characters what we like about these stories. I’m not using my name here, because that’s one of the story’s first surprises. While my creator Rosemary doesn’t own a sheprador like Adam Moreland does in “This is Not a Dog Park,” the emotional connection Adam has with his pet in the story reveals Rosemary’s bond with dogs. She idealized me, her canine character in this story, by giving me attributes she likes in the dogs she’s owned, including my general quietness, alertness, and loyalty. Most of the dogs in Rosemary’s life have been hounds. She currently owns a male, short-haired mixed hound. Before that, her family dog was a very docile female hound, park bluetick coonhound, I’m told. Teresa Inge: Cagney and Lacey are based on real life Yorkshire Terriers who help solve the crime. What a great cast of pups. I’m loosely based on Debbie’s Siamese cat, Oliver, who passed away last year. It’s always nice when authors put their pets in books. What do the dogs in this collection like most about their roles in the stories? Heather Weidner: Darby is a bundle of energy. She’s always ready to plan, enjoy a snack, or take a walk. And in “Diggin’ up Dirt,” she has a habit of digging holes in the backyard. But she uncovers some interesting things. Jayne Ormerod: I love going everywhere with my people-mom, Meg, even when we are chasing bad guys. She is my best friend and I would die for her. Almost did! I got to be the hero! And they had a party for me! I really liked that. Rosemary Shomaker: In “This is Not a Dog Park,” I like being Adam’s companion. He’s good to me, he loves me, and he and I get a lot of exercise. Our workouts rise to a new level when someone leaves a gift for us at our apartment door—a tennis ball chucker! Adam throws scores of tennis balls to me. I’m also a boss at Frisbee retrieving. Mostly, I’m happy to get Adam out of the apartment and interacting with other humans and dogs. Teresa Inge: That readers enjoy my stories. Great answers. I’m wagging my tail which is more like a swishing it, the cat version of tail wagging. Do the dogs talk in the book, or are they just a silent pet like I am? All the dogs in To Fetch a Thief are a silent pet like you. However, they do help their owners solve crimes and capers. Of claws they do. That’s the main job of cozy mystery pet characters. That and looking and acting adorable. Heather Weidner: Do what you do best! Dogs bring out the best in humans. I love that all the dogs in the four novellas are crime-fighters too. Jayne Ormerod: Keep your nose to the ground and keep your guard up. People aren’t always the best judges of character, but dogs are! Rosemary Shomaker: Dogs are great at unconditional love. My advice? Keep loving your humans, just like I love Adam. Seek to connect your humans to the world by widening your circle of human and dog friends. Your human needs you. Humans can be too introspective and often self-pitying. Keep pulling your humans out of themselves. Link them to the joys of everyday like being outside, simple walks, and a warm friend. Teresa Inge: Make them a character in the story with their own personality. Those are all great tips. I’ll share them with Fido and Ruby, and I think they can apply to cats, too. Do the authors have plans for any new stories? Please give dates and details. We are working on the second in the Mystery Mutt series. Stay tuned for more information. Heather Weidner: I’m working on a cozy mystery series set in Charlottesville, Virginia, and the third mystery in my Delanie Fitzgerald series. That will be out next year. Next year, I also have a story in Deadly Southern Charm: A Lethal Ladies Mystery Anthology, and a non-fiction piece in PromoPhobia. Jayne Ormerod: Not yet. Me and my people-mom are still getting over the frights in “It’s a Dog Gone Shame!” But I have a dog’s sense there will be more adventures for us some day. We make a good crime-solving team. 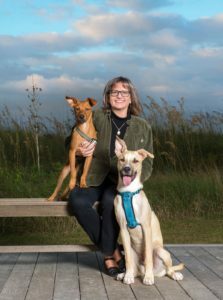 Rosemary Shomaker: Look for Mutt Mysteries Collection #2 in fall 2019 for more great dog stories. I may have a story in that collection! In the spring of 2019, you’ll find my “Heads or Tails” in the Wittier Than Thou – Tales of Whimsy and Mirth inspired by the life and works of John Greenleaf Whittier. It’s the third anthology benefitting the Haverhill, Massachusetts, Whittier Birthplace museum. Teresa Inge: Books two and three of the Mutt Mystery Series. Thank you all for the great interview, and best tail wags on your stories and the series. I’m sharing information about your blog tour below. Thanks, Sneaky for the great interview! We enjoyed hanging out with you and talking about books, writing, mysteries, and dogs. Thanks, Heather. Tail wags to you, the other authors, and dogs on your new release. I really, really like that Sneaky interviews pet characters! You’ve got a winner with this blog — it’s a nice way to get messages across to readers. Thanks for the exposure you’re giving To Fetch a Thief.